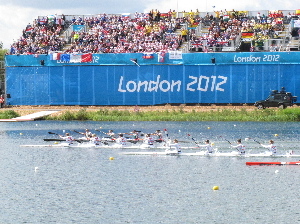 In July and August came the Olympics which we thoroughly enjoyed, either seeing the cycles whizz by in road race or time trial, or flat water canoeing at Dorney Lake, or watching on TV. Paul, Janet, Michael and Alistair stayed for a few days and together we went to Wembley Stadium to see a football match between S. Korea and Gabon (76,000+ people present!). Everywhere the atmosphere was superb with everyone enjoying themselves and very many young families. A few photos are below. For many more of the Olympics including preparations and roads, see David's photos on Geograph. 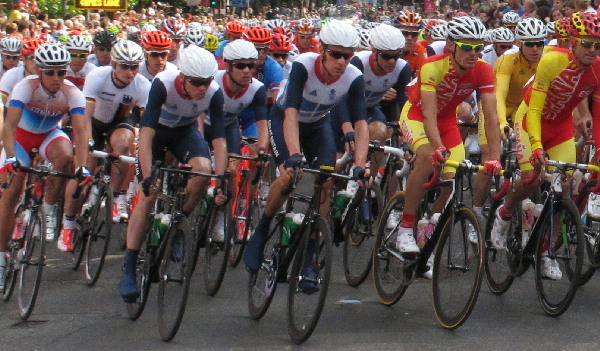 Men's Cycling Road race - in Brompton Road just after the start. Team GB in the centre, a rare cycling event where they didn't do well. Spain on the right. 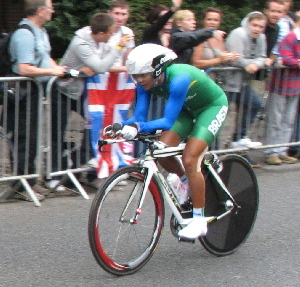 Brazilian woman Clemilda Fernandes in Olympic cycling time trial. This is on Hampton Court Way soon after the start. 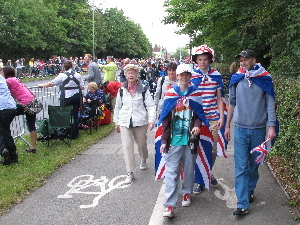 Hawgood family as spectators, Olympics Time Trial near Hampton Court. Barbara, Janet, Alistair, Michael and Paul. 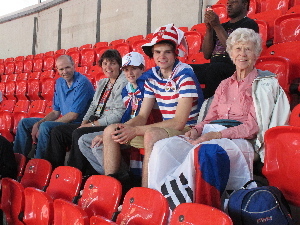 Hawgood family at Wembley to watch South Korea play Gabon. Paul, Janet, Alistair, Michael and Barbara.